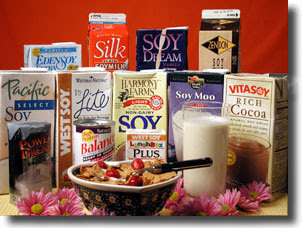 I learned early bout soy milk not being as healthy as it claimed to be. Almond milk is the healthiest alternative to cow milk. And i’ve never been big on consuming diet versions of anything versus the regular version because diet anything usually means a bunch of cancer inducing sugar substitutes. Below is a really good article on what “healthy” tricks you should look out for. Leave a comment and let me know what you think. You thought you were being health-conscious when you bought that granola bar and drank that soy milk, didn’t you? Turns out, you may have been wrong. In a perfect example of how you can’t trust marketing claims that this product is good for you or that product has less fat, Forbes examines some of the top healthy alternatives we think we’re making every day. Soy milk may brag that it’s the healthy alternative to regular fat-free and reduced fat milk, but its hiding some scary details. According to New York dietitian Robin Barrie Kaiden, “half the time it’s flavored and it has added sugar.” Soy milk is also genetically modified and no one yet knows what damage that may cause later in life. So for about $90 more a year, soy milk buyers are getting a product with higher calories and with more risk factors. Another outrageously priced product is organic peanut butter. No matter how you spread it, peanut butter is still peanut butter and it’s high in fat. It’s best to stick with the cheaper version or if you’d like to be healthier, experiment with fat-free cream cheese. You might find that a cream cheese and jelly sandwich taste just as good.